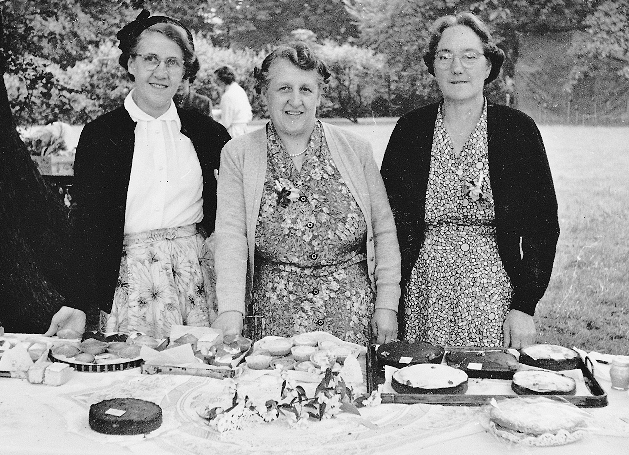 Stella Madeley, Edith Westwood and Annie Thorp at a Woodlesford village fete in the 1950s held in the grounds of Lawrence House, the home of Bentley’s head brewer, John Pirrie McKenzie and his wife Marguerite. Click on the pages in this section to find out about individuals who have lived in or made a contribution to the township of Oulton-with-Woodlesford. The area is now part of the Rothwell ward of Leeds City Council. From 1937 to 1973 it was administered by the Rothwell Urban District Council. Before that it came under the Hunslet Rural District Council established under the Local Government Act of 1894. There was also a combined parish council for the two villages. It first met in the Oulton schoolroom on 1 January 1895. Harold Trinder, the head brewer at Bentley’s, was elected the first chairman and John Walker, a manager for the Yorkshire Banking Company, was the first treasurer. The meetings were held every two months. Benjamin Wood Higgins. Chairman. Born 1849 in Oulton. Lived at Willow Cottage. He was an architect and surveyor carrying on the building and contracting business started by his father, Wood Higgins, who was also a stone merchant. Benjamin was very active in Oulton village life and was involved with the church, the scouts and the tennis club. He was one of the original trustees of the Oulton Institute and served as vice president for several years. In 1873, at St. Mary the Virgin in Hunslet, he married Annie Eliza Wilson, the daughter of Joseph Wilson, a Hunslet tanner and carrier who employed at least 6 men and 3 apprentices. Benjamin and Annie had 12 children. Seven of their sons fought in the First World War and two were killed. Their fourth son, Percy Craven Higgins, became the sanitary inspector for the Hunslet Rural District Council which included Oulton and Woodlesford. Another son, Herbert Wilson Higgins, was a leather merchant at the time of Benjamin’s death in 1923. Tom Batt. Born in 1845 in Leeds. Lived at Beechgrove. The son of builder Samuel Batt, Tom was a builder at the time of his marriage to Margaret Gosney at Wakefield in 1874. He later became an oil merchant with a business in Leeds and owned property in Pudsey. His son Percy followed him into the business. Robert John Smith. Born at Rotherham in 1853, he was an architect, land and mineral agent who lived on Alma Street. He was the first clerk to the Woodlesford school board and chairman of the Hunslet Board of Guardians and the Hunslet Rural Sanitary Authority. He moved to live at Garforth and was killed by a train near Micklefield in October 1911. Joseph Stringer Horn. Born at Methley in 1849, he owned and ran one of the two mills at Fleet Mills, previously under the management of his father, Thomas Horn. The mill made plaster, whiting and flint. In 1873 Joseph married Henrietta Annie Sylvester, daughter of the Rector of Castleford, Rev. William Thomas Mainwaring Sylvester. By 1911 Joseph had moved to Knottingley where he ran an earthenware pottery employing one of his sons as a potter. William Henry Newsome. Born in Oulton in 1866 he was the innkeeper at the Three Horse Shoes which he ran with his grandmother, Elizabeth Sharp (nee Ingham), following the death of her husband, Edward Sharp, who had been a stone merchant before he became a landlord. Edward was Elizabeth’s second husband who she had married at the age of 40, in 1869, following the death of her first husband, Joseph Newsome. Edward and Elizabeth adopted William Henry following the deaths of his parents. He married Helena Clayton from Rothwell in 1891. 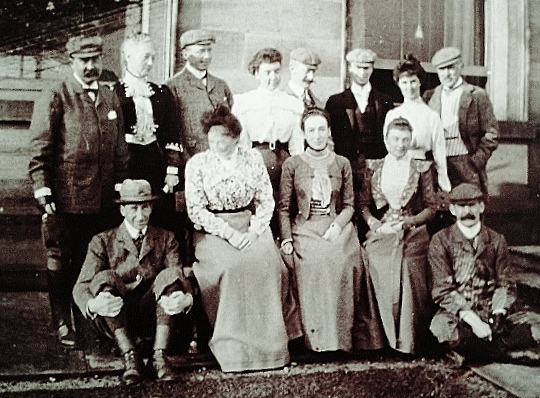 They had no children and later lived at Lawrence Villa in Oulton. 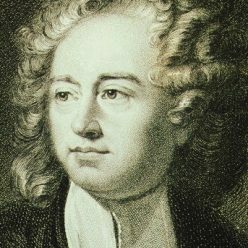 Thomas Murtland. He was the tenant at the Calverley owned Greenland Farm. He was born at Limavady in County Derry in 1845 and came with his wife and children to Oulton in the 1880s. For 20 years he was the treasurer of the Oulton Institute. His daughter, Josephine, became a pupil teacher at Oulton school. One of his sons, Robert, took over the farm whilst Alfred was a traveller for an oil firm and Charles worked as a clerk in the offices of John Farrer who managed the Calverley estate. Joseph Snell. Born at Pool-in-Wharfedale in 1840, he was a grocer with a shop on Aberford Road next to Oulton school which he opened in about 1866. In 1864 he married Margaret Milburn, the daughter of a watch and clock repairer from Holbeck. They had six children. After his first wife’s death in 1893 he married Sarah Anne Parish, an Oulton schoolmistress who came from Hazlemere in Buckinghamshire. In 1901 they were living at Lofthouse Gate and running a grocery there. By 1911 they had moved back to Oulton. He died in 1918. Ernest Boothroyd. He was the headmaster of Oulton St. John’s school for over 40 years. The son of a power loom turner from Earlsheaton near Dewsbury he went to college in York and was appointed at the age of 19 to be the headmaster in 1877. Two years later in early 1879 he helped form and played for the Harmonic football team at Rothwell and was a founder member of the first Oulton club the following September. He was also a keen cricketer. In 1882, at Dewsbury, he married one of his school mistresses, Cornelia Parish, who was born at Hazlemere in Buckinghamshire. She was the younger sister of the second wife of fellow councillor Joseph Snell. They were the daughters of William Parish, a post messenger, sexton and later a registrar of burials. William came from Hughenden in Buckinghamshire and his daughters may have moved to Oulton through a connection with Prime Minister Benjamin Disraeli who lived at Hughenden near High Wycombe and whose niece married John Selwin Calverley in 1888. John Cockerham. Appointed clerk to the parish council in 1895 on a salary of £5 per year. He was also an assistant overseer and book keeper for Oulton and collected the rates for the rural district council and the county council. He was born in 1851, the son of James Cockerham who had married Mary Ann Lee in 1844. James was a stone mason in Oulton and after his death, at the age of 34 in 1854, Mary Ann and her children went to live with her aunt, Elizabeth Wrigglesworth, the widow of William Wrigglesworth who had been a stone merchant and probably owned one of the quarries in Oulton. John Cockerham also became a stone mason and later graduated to managing a quarry before he became the assistant overseer. On Thursday 4 January 1883, at Oulton St. John’s church, he married Sarah Ann Pedder, the daughter of a market gardener from Silsoe in Bedfordshire. She had been working at Oulton Hall as a ladies maid and a witness to the marriage was Gertrude Mabel Calverley, who also got married on the same day, suggesting there was a strong friendship between her and Sarah Ann. John and Sarah Ann lived at Orchard Cottage on Farrer Lane but she died in 1891 leaving him a widower with two young sons and a daughter to bring up, although he probably was helped by his wife’s parents who had moved from Bedfordshire to live at the Old Lodge on the Calverley estate. His daughter, Elinor, went to live with her granny, Mary Ann, who appears to have inherited the Wrigglesworth property on Aberford Road in Oulton. She was 81 when she died in November 1902. John was only 58 when he passed away in 1909. 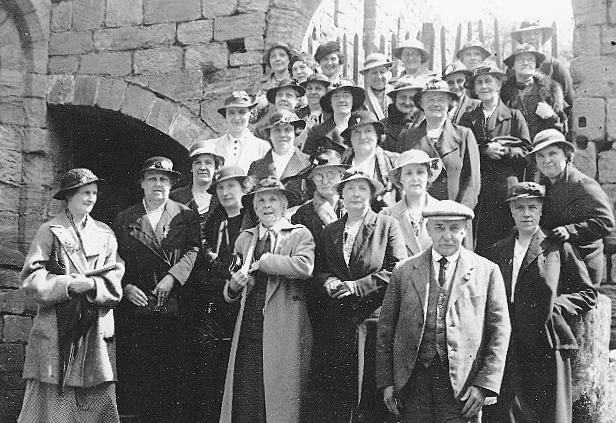 Woodlesford Mothers’ Union on a day out. Front Row: Vicar’s wife Jessie James, Unknown, Unknown, Mrs. Peters, Mr. Peters, Connie Wilkinson. Also in the picture: Mrs. Nicholson, Mrs. Murton, Mrs. Edwards, Francis Edwards, Mrs. Jacques, Alice Westwood, Annie Thorp, Sarah Thorp, Mrs. Foster, Clara Taylor, Mrs. Madeley, Mrs. Jones.